If you are in an older property you will not be allowed by regulations to install the dreaded uPVC double glazing frames, which ire very ugly and low quality. Window frames should be wooden to match the old style property. See these photo images below to get an idea of what needs to be done. 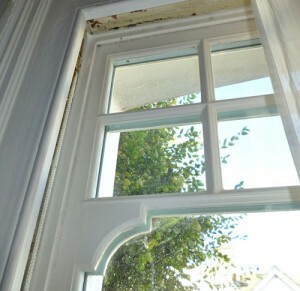 This is not a DIY fix, this is all done by the skilled double glazing and framing experts. This is what differentiates the cheap salespeople that flog rubbish double glazing around the streets, and the experts who are usually in great demand and have a waiting list. 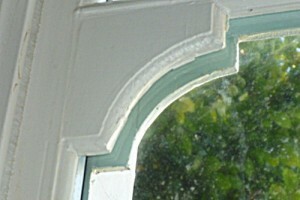 They will measure up the window gap, and fit the new double glazed window into the old frame, if it is in good condition. Sometimes a whole new frame will be needed. This includes the cable system that makes the window go up and down, which is called a sash system. Double glazing will increase the energy efficiency of your home, prevent draughts, and also increase security. Good quality double glazing will also increase the value of your home – but low quality double glazing will reduce it! Above: you can see how the framing is made and then glued to the glass. The double glazed unit is factory made as usual. The fancy framing to match the old style property is actually fake! 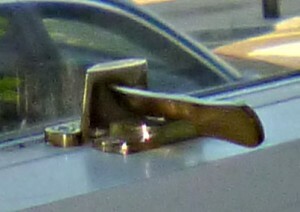 Above: close up of the curved wooden detailing on the glass – can see the back of the matching other side piece through the glass. 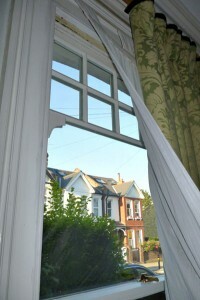 Above: general view of this fantastic looking old style window, with the latest high quality double glazing. Not brass window locks – security is a big issue these days and these windows come with high quality locks including bolt locks on the inside of the frames, and side limiters so you can open the window a small distance in hot weather. Above: nice looking brass locks give authentic traditional appearance and are very safe and practical too. 1 Response to "Double glazing, traditional style, wooden frames and security on period or listed houses"
It is definitely better to get wooden windows for an old property. Getting the ‘dreaded uPVC’ can cheapen the way a property looks. Also, with sash windows you can get them renovated so they become a good investment.